Cathodic protection is an extremely powerful technology in that it has the power to almost completely stop corrosion on the structure it is deployed on. Most corrosion protection methods are passive in nature – such as paints. Cathodic protection is very much active. It attacks the corrosion problem at its heart. The Middle East with its high temperatures and extremely high saline content of its sea-water & ground water forms an extremely aggressive environment in terms of corrosion. When constructing structures that are exposed to this environment the challenge is how to ensure corrosion durability. For diaphragm walls that are cast in situ, this is a special challenge for two reasons. The first reason is that during construction, some methods employed involve the boring of the excavation, lowering the steel cage into the bored excavation and then casting. The excavation is typically inundated with bore -hole chemicals to ensure that the excavation does not collapse. During this period, it can be expected that chlorides from the surrounding groundwater permeate the excavation walls. Therefore it follows that the reinforcing steel cage will, once it is lowered, be immediately exposed to potentially high levels of chloride. The second reason that diaphragm walls are a challenge in terms of ensuring durability, is the exposure after construction. 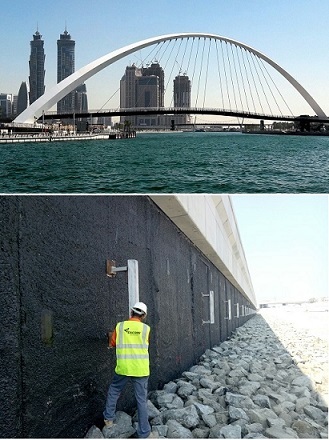 On one side the reinforcing steel is exposed to highly saline sea-water, while on the soil side, the wall is exposed to highly saline ground-water. The wall is seemingly sandwiched between to very corrosion environments. By deploying a well-designed cathodic protection system using impressed current, the corrosion of the reinforcing steel can be stopped or significantly reduced to a negligible amount. Cathodic protection (CP) is a technique used to control the corrosion of a metal surface by making it the cathode of an electrochemical cell. A simple method of protection connects the metal to be protected to a more easily corroded "sacrificial metal" to act as the anode. These systems (also known as sacrificial cathodic protection) can be designed with a service of approaching 20 years. For longer service life systems, the ‘sacrificial metal’ method above is not sufficient. Metals made from coated titanium cast into the concrete matrix. These provide a means to create electrochemical cell, by introducing direct current onto the steel to be protected, in this case the reinforcing steel. The source of the direct current is typically located close to the structure in an electrical room. These systems can be designed in excess of 50 years. Once deployed, these systems can be monitored with extreme ease remotely. Many asset owners fret about the upkeep of these systems. In fact, the upkeep is insignificant. With IoT devices, Ducorr has already developed systems that can be monitored from your smart phone or tablet, sending you updates at intervals you chose. These systems are extremely powerful durability tools providing a hands-on and active approach for managing corrosion – almost unheard off a few decades ago. The protection of assets from corrosion is a key commercial, safety and environmental issue. Deterioration of concrete structures can become a challenge for the owners of structures such as bridges, walkways, high rise buildings, etc. It is important to identify these defects on time and plan appropriate repair strategies. Concrete deterioration can occur through scaling, disintegration, erosion, corrosion of reinforcement, delamination, spalling, alkali-aggregate reactions, and cracking of concrete. Moreover, corrosion of reinforced steel is the main cause in modern concretes. Successful contractors understand the importance of adding value to their clients' assets/structures. One of the best ways to do this is to offer additional services that provide a cost-effective benefit to the client. Contractors can provide value added service to their clients through the application of cathodic protection. Cathodic protection system stops the corrosion cycle in concrete by utilizing an electrical current. It can be an add-on service for the concrete contractor and a cost-effective benefit to the client. How does cathodic protection work? In the simplest terms, a small DC electrical current is discharged off of an anode and flows through the concrete to the reinforcing steel. This protective current prevents corrosion from occurring. A small power supply unit converts AC power available at the site to DC power to provide the negative charge, which is used to arrest the natural corrosion process. Typically these systems use very little power -- not much more than a conventional 120 Watt electric light bulb. The contractor has a wide range of decorative top coats available to finish the process while meeting the aesthetic requirements of the project. For more than 20 years, this proven technology has been employed successfully on numerous installations in coastal environments. Contractors should be encouraging their clients to consider cathodic protection when major repair projects are undertaken. The first reason is the most important -- quite simply, cathodic protection stops the repair cycle by preventing further corrosion. When the client/owner completes a major concrete repair only to find that more corrosion is occurring just a few years later, there is an unhappy client eager to blame the initial repair contractor. Cathodic protection stops future corrosion which in turn stops the vicious restoration cycle. Stress corrosion cracking (SCC) is a type of environmentally-assisted cracking (EAC), or the formation of cracks caused by various factors combined with the environment surrounding the pipeline. SCC occurs as a result of a combination between corrosion and tensile stress. Corrosion is related to the susceptibility of the material to the environment, while stresses may be residual, external or operational. The most obvious identifying characteristic of SCC in pipelines, regardless of pH, is the appearance of patches or colonies of parallel cracks on the external surface of the pipe. SCC is usually oriented longitudinally, and the dominant stress that causes it is usually internal pressure. Here we'll take a look at some different types of stress corrosion cracking, and how they occur. The occurrence of SCC depends on the simultaneous achievement of three conditions. The conditions at the pipe surface are referred to as "the environment." This environment may be isolated from the surrounding soil by the pipe coating, and the conditions at the pipe surface may be different from those in the surrounding soil. The four factors controlling the formation of the potent environment for the initiation of SCC are the type and condition of the coating, soil, temperature and cathodic current levels. Pipeline Coating Types: SCC often begins on the pipeline surface at areas where coating disbondment or coating damage occurs. The ability of a coating to resist disbonding is a primary performance property of coatings and affects all forms of external pipeline corrosion. Coatings with good adhesion properties are generally resistant to the mechanical action of soils from wet/dry cycles and freeze/thaw cycles. They also are better able to resist the effects of water transmission and cathodic disbondment. Soil: There are several factors relating to soils that influence the formation of an environment that's conducive to SCC. These are soil type, drainage, carbon dioxide (CO2), temperature and electrical conductivity. The amount of moisture in the soil also affects the formation of stress corrosion cracks. Cathodic Protection: The presence of cathodic protection (CP) current is a key factor in the formation of a carbonate/bicarbonate environment at the pipeline surface, where high pH SCC occurs. For near-neutral pH, SCC CP is absent. Temperature: Temperature has a significant effect on the occurrence of high pH SCC, while it has no effect on near-neutral pH SCC. When tensile stress is higher than threshold stress, this can lead to SCC, especially when there is some dynamic or cyclic component to the stress. (For more on this topic, read The Effects of Stress Concentration on Crack Propagation.) Stress is the "load" per unit area within the pipe wall. A buried pipeline is subject to different types of stress from different sources. The pipeline’s contents are under pressure and that is normally the greatest source of stress on the pipe wall. The soil that surrounds the pipe can move and is another source of stress. Pipe manufacturing processes, such as welding, can also create stresses. These are called residual stresses. SCC in pipelines is further characterized as "high pH SCC" or "near-neutral pH SCC." Note that the "pH" here refers to the environment on the pipe surface at the crack location, not the pH of the soil itself. High pH SCC occurs on the external surface of pipelines where the electrolyte in contact with the pipe surface has a pH of 8-11 and the concentration of carbonate/bicarbonate is very high. This electrolyte is found at disbonded areas of coatings where the CP current is insufficient to protect the pipeline. This type of SCC may develop as a result of the interaction between hydroxyl ions produced by the cathode reaction and CO2 in the soil generated by the decay of organic matter. This form of SCC is temperature-sensitive and occurs more frequently at higher temperature locations above 100°F (38°C). This is why there is a greater likelihood of SCC immediately downstream of the compressor stations where the operating temperature might reach 150°F (65°C). The high-pH form of SCC is intergranular; the cracks propagate between the grains in the metal, and there is usually little evidence of general corrosion associated with the cracking. These cracks are very tight, narrow cracks. A near-neutral pH SCC environment appears to be a dilute groundwater containing dissolved CO2. The source of the CO2 is typically the decay of organic matter and geochemical reactions in the soil. It has been found that low pH SCC occurs in environments with a low concentration of carbonic acid and bicarbonate ions with the presence of other species, including chloride, sulfate and nitrate ions. Typically, the SCC colonies initiate at locations on the outside surface, where there is already pitting or general corrosion. This damage is sometimes obvious to the unaided eye, while at other times it is very difficult to observe. The near-neutral-pH form of SCC is transgranular; the cracks propagate through the grains in the metal and are wider (more open) than they would be in the high-pH form of SCC. In other words, the crack sides have experienced metal loss from corrosion. Near-neutral-pH SCC is less temperature-dependent than high-pH SCC. Stress corrosion cracking in pipelines begins when small cracks develop on the external surface of buried pipelines. These cracks are not visible initially, but as time passes, these individual cracks may grow and forms colonies, and many of them join together to form longer cracks. This process can take many years depending on the conditions of the steel, the environment and the stresses to which a pipeline is subjected. Consequently, failure as a result of SCC is relatively rare, although failures can be very costly and destructive when they do occur. Accelerated Low Water Corrosion (ALWC) is a relatively new phenomenon, and an extreme form of aggressive corrosion, that majority of the time occurs slightly above Lowest Astronomical Tide (LAT) level, and is reported to have occurred along submerged sections. The occurrence is on unprotected steel in tidal areas. The cause of this is due to bacterial activity, and is therefore a microbial influenced corrosion (MIC). This occurs when sulphate resisting bacteria, an anaerobic bacteria, grow on steel forming a colony, if growth is sustained for long enough it forms a biofilm. This patch of bacteria does not directly consume the steel; however, it promotes and aggressively increases the rate of corrosion as it makes the ideal environment for it. According to CIRIA C634 this process is random, and a successful method for predicting its occurrence has not been developed. Cases of ALWC have been reported from around the world in all tidal areas, and cause of its occurrence has not been truly understood. Its high variability is baffling as variation occurs in the local geography, where some piles are found with ALWC and some piles within the same vicinity are found to be free of it. The time scale is variable also as it is a multi-stage process and not linear like in table 2, which underestimates ALWC, as the rate of corrosion varies depending on the micro-environment. However, once the biofilm has formed rates of metal wastage is very high, making it possible to see patches within a couple of years. As a rule of thumb localised corrosion rates are 1.5 to 3 times more than the general uniform corrosion rates. Currently the only reliable method of detecting ALWC is by visual inspection together with residual wall thickness measurements. ALWC occurs as localised patches of damage, identified by a characteristic, poorly-adherent orange corrosion product over a 'soupy' black underlayer associated with rapid metal thinning. The strategy for management of ALWC will depend on whether the structure is new built or an existing structure. The corrosion protection measures that are currently applicable to ALWC are those based on conventional corrosion control methods such as cathodic protection (CP) and coatings of various types. The Middle East is well known for the presence of a very aggressive salty water table that sits barely a few meters below the surface. As we all know, salt and water coupled with heat are the perfect blend to create corrosion nightmare of concrete structures. Concrete Cancer, often identified by flaking concrete or rust stains, which originate deep within the concrete is a serious problem caused by corroding/rusted reinforcing steel from within the concrete. As steel rusts it can expand up to 7 times its original size causing the surrounding concrete to crack. As the steel pushes the concrete away, more water gets to the steel expediting the process. Spalled concrete can be a safety hazard. Concrete cancer and delaminated concrete should be treated immediately as deferring the treatment will inevitably lead to increased problems into the future. Similarly, treating the visual aspects such as rendering over the steel are short-term solutions as the rusting process will continue below the surface causing the steel to again displace the concrete and in some cases, rust so badly the steel eventually needs replacement. This approach – we call it the ‘make up’ approach – is aesthetic. In essence, the ugly bits are removed and given a nice clean looking finish, however the underlying problem is very much still present. Within a short time, the area adjacent to the area repaired is cracking and breaking and requires repair. You are back to square one. The appropriate and effective treatment necessary is cathodic protection – an electrochemical method of arresting corrosion for an extended period of time – ranging from 5 years to 50 years. Ducorr’s SHIELD™ technology is easy to install into dilapidated atmospherically exposed concrete areas and achieve excellent corrosion protection. The system uses permanent power to provide sustained protection by simply making the corrosion reaction impossible to occur. There’s lots of thermodynamic theory behind, which would be too long for this article – but in essence cathodic protection is the ONLY method that address corrosion at an elemental level eliminating the possibility of any further damage. The Dubai Water Canal is key infrastructure project that involves the construction of water canal that routes just east of Sheikh Zayed Road to the Jumeirah beach. The canal mainly consists of block wall construction. However, in a minor section of the canal, the construction incorporates a reinforced concrete diaphragm wall. The project specification requires that the reinforcing steel of this diaphragm wall be protected from corrosion using cathodic protection designed and installed by DUCORR. Contact us to deploy your system now.